Super Hero Boy: The Barnyard is back! 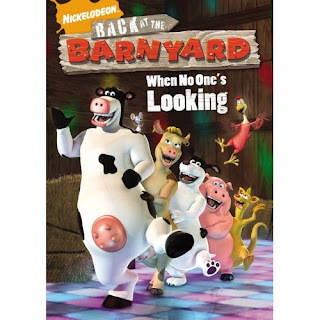 All the characters you got to know and love in the animated movie The Barnyard are back in Nickelodeon's animated series based on the movie. It features the same great characters, animation, and a simular plot to the Barnyard movie, but I just keep feeling as something is missing. The Barnyard movie was full of action, tons of mischief, and some crazy barnyard animals getting in trouble at every turn. The series however is much more tamed down, maybe in an attempt not to give kids the wrong idea, but it works out either way. Really If I had not seen the Barnyard movie I would be just ecstatic over this animated series. Back at the Barnyard : When No One's Looking features the first eight episodes of the twenty episodes in the first season! That means you can look forward to at least two more Back at the Barnyard releases in the upcoming months! The only real downfall to the series.. identifying so closely with barnyard animals may leave some kids loosing their appetite for a hamburger at least briefly. heh. Back at the Barnyard : When No One's Looking is available right now on Amazon! I have three copies of Back at the Barnyard : When No One's Looking to give away to my readers! Leave a comment on this post. Check out Back at the Barnyard : When No One's Looking and tell me why your kids would love to have their own copy! I'd love a chance to win for my kids. They'd love it - because we live on a farm and they adore farm animals! Plus, they've saw the movie and enjoyed it! =) Thanks for a chance to win. I am sub'd to your feed, as well, for an extra chance. Thanks. My granson would love it because it's about a carefree party boy cow. He loves to have fun. The lesson in responsibility is great timing for us! We saw the original Barnyard movie which my son really liked, so I know this new one he would love just as much. Thanks for the chance to win! I didn't know about this movie before now. We loved the first movie. A party hardy cow. Gotta love it. Oh my!! My son would absolutely *love* this!! My grand niece would love this because she has a such a passion for all the animals but really loves cows! My son loves them. We own the movie and a ps2 game and he would be so happy if I won it for him. He loves how animals are so silly. My kids love this show. All the silly animals make them laugh. My grandkiddos would love this, because it is funny. thank you for this giveaway! We loved the movie, and it was really cute, I'm sure the series is a lot of fun. We watched the first movie at the theater & just loved it! So I'm sure this one will be great too. I subscribed to your email blog too. My daughter would love this DVD, she watches this shows frequently and is always cracking up when she watches it. Thanks so much for the neat giveaway! My kids would love to win this because it is something that all 3 of them can agree on. My daughter is crazy about this show. She would love to have a DVD! My kids love the movie and the animated series. My girls watch this show every weekend and I would love to surprise them with their own copy to watch whenever they want. Would love to win this for my son who thinks the animals are hilarious. My 6 yr old would love this, she has watched the show before and liked it alot! I am already a subscriber...thank you! My love it, the talking farm animals are really funny. I would love to win this for my kids because they love animals so much. They would really enjoy watching this movie. Thank you so much. I think Rylee would really like this. She loves making animal sounds. We haven't seen the show. Forget the kids...I would love a copy. This looks like a cute show and I love the cow. My kids love this show! They love animation. My grandaughter would love this because she loves farm animals. Her favorite in this series is the pig, but I like the cow myself! My boys love anything to do with anmials. Talking animals would be even more fun! My kids loved the first Barnyard movie, I'm sure they will also like this one. I watched the original with my grandkids and laughed harder than they did! Too much fun! Thanks for the chance to win! the kids get a kick out of this! My daughter loved the first Barnyard movie & we live on a farm! This is very funny, even I get cracked up at it. I think my little boy would really enjoy it when he gets a little older. I would like to win this for my grandson because he loves farm animals, especially pigs and cows. My son loves this show! We watch it on tv a lot! Niece and nephew would love this, thanks. Yes,my grandkids would love this dvd also. Watch it and love it...SO much fun for the kids...thanks! My grandkids would love this because the characters are so cute and they love to have fun. They love this stuff. Thank you so much! My daughter LOVES this show. Thanks! I'd love to win this for my niece and nephew because they love farm animals....all animals actually, but my nephew especially loves cows. They both have a great sense of humor and are very smart so they would enjoy the silliness of this movie as well as the messages it shares. I would stash this away for the long car trips from VA to NY! Talking animals says it all~! What child wouldn't love this movie. I have never seen it nor has my niece but I know she would love it! And since I have yet to see it I think we would love watching it together. Have a great day~!!!! We are city people - my sister and her family live on a farm, and my daughter is not fond of going there! This just may have her wanting to visit the farm! Thank you for having this. This is one of my daughters favorite shows and this would be wonderful to win for her. Thank you! My kids love Otis and the other animals and I know they'd be thrilled if I won this for them! I would love to win for my friends kids. She is about to have twins. My husband and I are trying to have a baby. We would love to have this in our collection. I think we would love to watch it just us. We like animated movies. We still have not seen the first movie of this yet. Drives me nuts, but my kids love it. Their Daddy likes silly cartoons too. My kids would love to have a copy of this movie, because we don't have cable (and I would, because OMG the "I'm bored" chorus is getting pretty loud as summer is in it's final momemnts). They enjoyed the movie, but we were all perplexed by why the bull has an udder...have we ever figured that out? lol Let me know! They love animals. They'd love the dancing too. My daughter would love this: she loves farm animals and she's just starting to 'get' humor in movies, the comical adventures would make her giggle! My son would love this DVD, the animals are so cute and silly. My sons LOVE this show! Thanks for the chance to win such a great prize!! This is a cute show and my kids would love to have the dvd. My son thinks this is hilarious. Any variety in our life would be wonderful. Thanks for the great giveaway! My son loves the animation! I am a subscriber to your feed. We haven't seen the movie or series, but it sounds 2 cute. My son would love the bright colors and the voices. my grand son loves to watch this with me on saturday mornings - it would be great to have this to share!! We love cows at our house - this would be one of my granddaughter's favorites! My kids watch this show on the weekends and they love it. We also saw the movie in theaters. They'd be thrilled to watch this DVD. Computer Generated Cartoons are so fresh and fascinating to watch. Please accept my entry. All three kids love this show and I must admit, I have chuckled a time or two myself! I know the kids would laugh and giggle their way through this! Please count me in ! My grandson and I love this show. As a Kentuckian, I was initially concerned with the concept but we worked it out. My little one can't get enough of animals! My daughter would love this movie. Please enter me. My daughter loves animals - this movie also makes her laugh. My daughter thinks this show is so great. Its so silly. Talking animals. ANd they get into so much. I love the one lady that knows they talk, and everyone else thinks shes crazy. I sometimes help watch my nephews, and they love anything that has to do with animals. Their all-time high was going to the zoo last weekend. This would be an entertaining video for them...and provide a little quiet time for me. Lol. I would love this for the grandkids. The show is full of funny, talking animals. Our whole family loves it but we only see it on weekends. I keep stuff like this put away and when someone is sick or kids are stuck inside, they pick a dvd out of a "secret bag". I think my son would just love to watch the animals. We went to the petting zoo last week and he just loved that! My kids would love this DVD because they are huge animal lovers and the animation is great. My kids love this show. They chose to watch it more than any other show during their "TV Time". Otis is their favorite character. The original movie had reverse cow-tipping and my kids love that! we love the barnyard movie and we watch the tv show regularly. thanks so much! My kids love farm animals because their Grandparents are farmers. I've always wondered why Otis has an udder? This show has us in giggles. Thanks. My kids loved that movie. My daughter loves movies with animals. She likes to point and identify them and what sounds they make! The grandkids love animals on the farm. My friends kids would love this - they love animals! I would love to win this for my nephew who loves this show! Thanks so much!